The electric motor alone is more powerful than your VW Golf R.
The McLaren Speedtail is being shown to the public for the first time here at the Geneva Motor Show and it turns out it's more powerful than we thought. McLaren's design chief, Rob Melville, was on hand at the company's stand to give us more details. The world was previously told the Speedtail's combined power output was a serious 1,010 hp, but further testing has revealed that figure is really 1,035 hp. In addition, the exact details of how this was split between the ICE and electric motor was unknown. Until now. 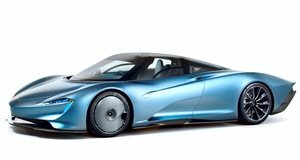 The Speedtail uses the 4.0-liter twin-turbo V8 that is currently used in the 720S and Senna but is suitably modified to work together with the electric motor. In this application, it produces 746 hp and 590 lb-ft of torque, slightly less than in the Senna's 789 hp but 36 hp up from the 720S. A more relevant comparison would be with McLaren’s previous hybrid hypercar, the P1. It made 727 hp and 531 lb-ft from its previous-gen 3.8-litre twin-turbo V8 and gained an additional 177 hp and 192 lb-ft from its electric motor. The Speedtail not only trumps the P1’s ICE specs but its electric motor is way more powerful too, pushing out 308 hp and 256 lb ft of torque. The Volkswagen Golf R, to compare, has 280 hp and 280 lb-ft. This is how the Speedtail manages to make that massive 1,035 hp and 848 lb-ft combined total. Big advances in battery technology mean that not only is the Speedtail’s battery pack denser than that of the P1 but also four times lighter too. That gives the new hybrid GT hypercar a claimed dry weight of 3,153 pounds, 44 pounds lighter than the P1. The Speedtail will be using its electrical assistance solely to assist the twin-turbo V8 in getting the three-seater to 186 mph in a mere 12.8 seconds (the P1 needs 16.5). Furthermore, it will not offer an electric-only mode as in the P1. We can’t wait to see how it compares to the current and upcoming crop of hybrid and electric hypercars in the real world. For now, we will have to wait until 2020 when the first cars will start being delivered to the 106 lucky owners.